The James Millen Memorial Station is located at the Museum Annex of the Antique Wireless Association in Bloomfield, NY. This is the station which was used by Millen in the late 30's and basically stayed untouched at his home until being relocated in 1985. Below are pictures of the station as provided by John Dilks. This station has been returned to operation and is frequently used for AWA activities and events. If the reader requires further information on the station and the move they can reference the AWA's Old Timers Bulletin, Volume 35, Number 4 (November 1994) or Electric Radio Magazine issue number 69 (January 1995). 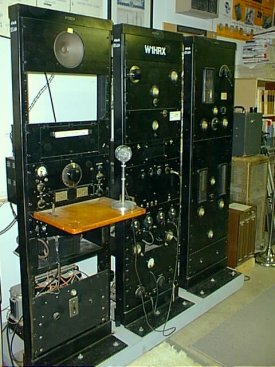 Receiver: Behind the microphone is an early production run National HRO receiver. The Receiver was restored by Bill K3ZJW. Transmitter: Comprising most of the three six-foot relay racks, this 1KW transmitter uses push-pull 204A finals and a pair of 851's in the modulator. You can see the glow of the 851 modulator tubes in the right-side picture. 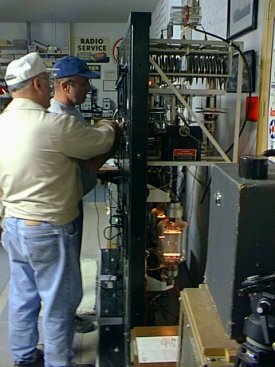 The transmitter was restored by Bob W2ZM.